Melinda Beth: I did myself a favor today. 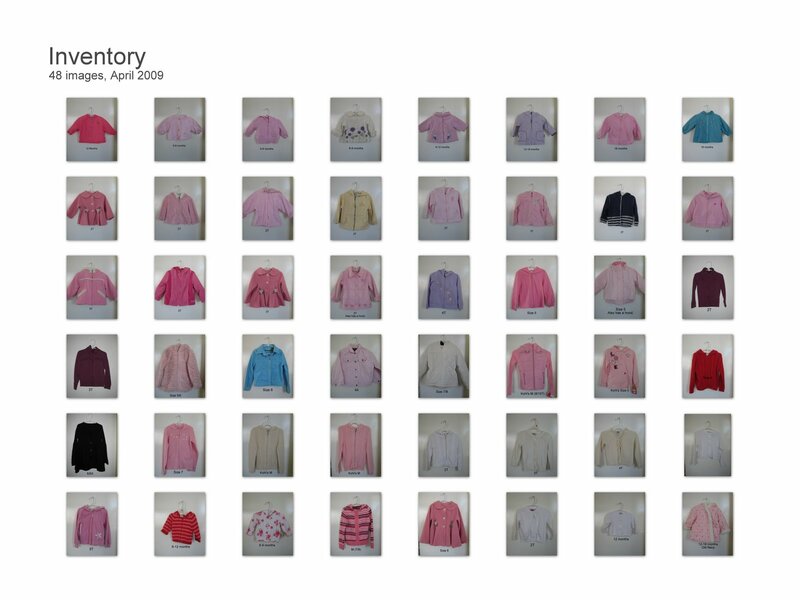 I took inventory of my children's jackets today. It's spring, the weather is warm, so I decided to pack up the winter coats. I keep them in bins in my garage and every year when it begins to get cold I forget what jackets I have for the kids to wear. 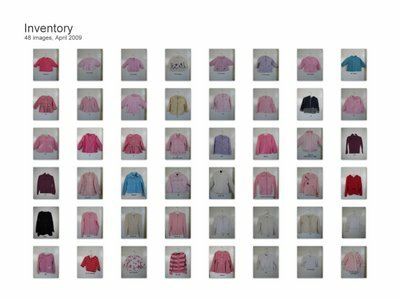 So this year I did myself a favor and took a picture of every kid's jacket and added text to the photo to tell me the size so that I could have an indoor digital inventory of what is in those bins. That way next year I can help myself to remember what it is I'm looking for and avoid bringing the bins inside the house. Tomorrow I will do the boy's jackets...., maybe. The bins will actually probably sit here next to my computer for another 3 weeks until I feel like doing it. Ok. I know this might seem like an absurd amount of jackets, but keep in mind that it is sizes 6-9 months to size 7/8. There is at least 1 light weight jacket, 1 heavy jacket, and 1 church sweater for each size. I have children's clothes coming out of my ears!!! I also cleared the girl's drawers of their long sleeved shirts and pants this evening and need to find a place to put them. You might think it would make sense to just leave them in there, however, if I don't put them away, Sarah will insist on wearing long sleeved shirts and "long sleeved pants" in 90 degree weather this summer. I'm doing it for her health. oh how I want to put the winter coats away. I was getting ready to, tempted to, and now it is snowing like mad!! I'll guess we'll wait til JUNE!! Wow, that's impressive-both that you took the time to do it and that you knew how to put all of those cute little pictures individually on a grid like that in your blog-oh yeah, and that you have that many jackets! I wonder how many we would have if I did that? Hmm...it's snowing right now so it would be a nice Saturday snow day thing to do-oh how I do not look forward to organizing my children's clothes! Three girls means keeping everything until Alli grows out of them...of course your situation is much more perpetual than that...what a blessing that we have this "problem", right!? I was impressed with the grid thing too. But it's actually really easy. If you use Google's Picasa, you just highlight the pictures you want in the grid and click on "collage" at the bottom and then I opted for the "contact sheet" on left sidebar, then saved it. It saves it as a new JPG file. I know it will be a bittersweet day when I know I'm finished having children and I won't need to keep all the clothes anymore. I'll be sad because no more babies, but I will gain so much more square footage in my closets and attic!